I will readily admit that I can be a little bit obsessive. Often, this will translate itself into a tenacity and ferocity in the things that I have my mind on. I am a deeply devoted friend, mother, and wife, which can mean anything from worrying about my son’s sleep habits to giving unsolicited advice. This can be nice or enraging. My husband’s enthusiasm was not so easily dampened. He began to typeset my manuscript to make it more fun to read. The result was a couple days where I learned the basics of typesetting. (This is fun when there is no pressure, and annoying when InDesign fraks up.) Thursday morning, Sam and I took a leisurely walk through the neighborhood to a copy center on 7th Avenue. This was a fun trip for both of us because the copy center also sold toys. SCORE. The copy man gave me a discount. He was surprised by the page volume and I guess felt bad for me. Sam wanted dinosaurs. I got a project folder for the manuscript. When the pages were printed and sat in front of me on the counter I felt that rush again. Nerves and excitement, adrenaline and nausea. Now physically in my hands, on paper, looking like a book, I knew a few things even more clearly than before. I knew I would finish the work because the hardest part was already done. The part of pressing through the creating. I have a full story. No, it’s far from perfect, but it will go through many more stages before it reaches (or doesn’t reach, because there will always be flaws in anything created by human hands) perfection. This too, is OK. I have been ensconced in editing since Thursday. I’m a little over halfway through the manuscript. I’m cutting words like nobody’s business. There are a few pages — *see below — where I thought, WTF?!? Those pages will become almost unrecognizable. Eventually the words will be right, and then the obsession will turn into something else. Congratulations! Completing that first manuscript is a dear memory. For myself, I concluded the last word with an evening long sigh and a dinner at Applebees. 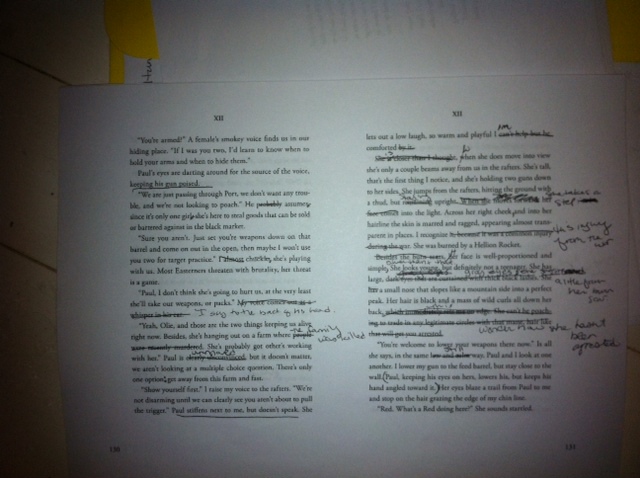 Editing is daunting, yes, but the story is there in your hands. It’s like sculpting a statue. The form is there, posed and recognizable. Now it’s detail work. No matter what it calls for celebration. It was like I got there, and I looked around not sure exactly what had just happened. I like your “sigh” comment. Very accurate to the emotion. Thanks! 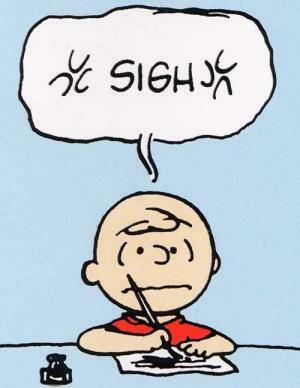 Hey, Beck – I laughed that you used Peanuts characters to express your glee. I hadn’t even read this yet but used Snoopy dancing on my Facebook last night to express how I felt that school was almost over. Great minds, eh? Or at least excited ones!!! Hahaha, I know, I saw that. I thought the same thing. 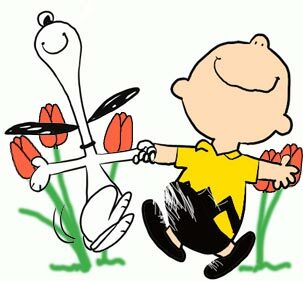 I love the snoopy happy dance music too. Finish the year strong Pen!